BCDB Rating: 2.4/5 Stars from 7 users. This page has been viewed 92 times this month, and 8351 times total. Cartoon Characters: Maggie, Mrs. Caloway, Grace, Wesley, Rusty, Buck, Slim, Junior, Rico, The Willie Brothers, Jeb, Sheriff, Pearl, Audrey, Ollie, Piggies, Larry, Lucky Jack, Barry, Bob. Directed By Will Finn, John Sanford. Produced By Alice Dewey Goldstone, David J. Steinberg. Animated By Dale Baer, Russ Edmonds, Sandro Cleuzo, Mike Surrey, Chris Buck, Mark Henn, Duncan Marjoribanks, Bruce Smith, James Lopez, Andreas Deja, Tony DeRosa, Brian Ferguson. Written By Will Finn, John Sanford, Michael Labash, Sam Levine, Mark Kennedy, Robert Lence, Shirley Pierce. Music: Alan Menken, Glenn Slater, k.d. lang, Bonnie Raitt, Tim McGraw. Originally Released on March 21, 2004. Three dairy cows band together as bovine bounty hunters and set out to nab a notorious cattle rustler in order to save their farm. Production budget estimated at $110 million. You can watch this cartoon today on your computer. Just click below to start viewing "Home On The Range" online now. Do you have anything to add to this page? Have we made any mistakes... or do you have any additional information about Home On The Range? If so, we would love to hear from you. Please send us a quick note with your additions or corrections to this page, and we will make the corrections as soon as possible! Below are comments about this cartoon submitted by people who have seen this show. 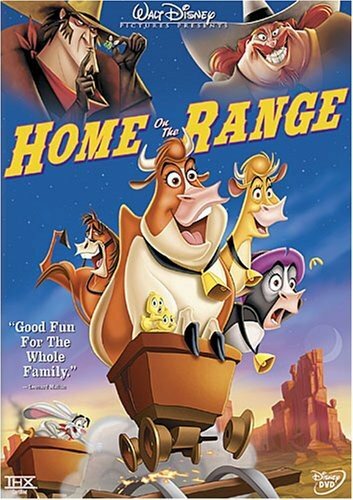 Take a look and see what others have said about Home On The Range. We want to know what you think, too!! Feel free to share your own opinion- we do want to hear from you! You can add your own comments here. 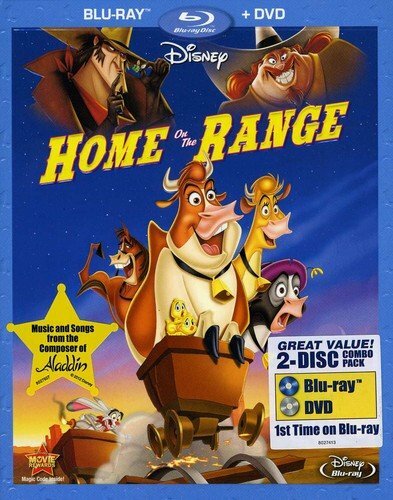 Home On The Range by Big Cartoon DataBase is licensed under a Creative Commons Attribution-NonCommercial-ShareAlike 4.0 International License.